SPECIFICATION IN BRIEF Length over all61.0 m Breadth14.0 m Draught3.5 m Battery capacity500-1500 kWh Service speedCan be configured for 8-13 knots Vehicle deck capacity50 cars Passenger certificate200 pax. ... 1863, has an established history of building a variety of vessels including custom motor and sailing yachts, fishing boats, tow boats, patrol craft, passenger vessels, ferries, research vessels and naval craft. ... the effects of petroleum pollutants in Baltic Sea area and other auxiliary tasks defined by Polish Ministry of Defense. The vessels will be designed and built according Polish Registry of Shipping Rules. Ships are used to transport cargo and/or passengers. Such vessels are longer and of greater displacement than those referred to as boats. However, there is no precise differentiation of the two, with the exception of certain nations whose legislation defines each category. 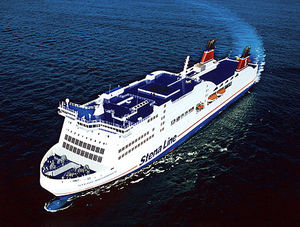 Most ships are used for the commercial transport of merchandise or passengers. These include, cruise ships, container ships and all those designed to carry liquid or solid bulk cargoes such as tankers, grain and ore carriers. Some exceptionally large yachts also can be called ships.